LeBron James has been to so many trips to the NBA Finals we almost take it for granted. In fact, the last time LeBron-less Finals was 2010 when the Lakers played the Celtics in an epic seven-game series. But as much as it has given us great joy to watch one of the all-time greats play in the NBA’s biggest stage seemingly year after year, some of those Finals trips came at a cost for LeBron. Besides the obvious fatigue and physical toll on his body, LeBron has also taken a beating on the public stage. No player in the basketball world takes more abuse on social media and cable TV than James. Skip Bayless built much of his TV career as a professional pundit hammering LeBron and all the holes in his game. There’s not many holes in LeBron’s game, but if there’s a hole Skip will find it. Through the first two rounds of the 2018 NBA playoffs, LeBron has been spectacular. He’s been so spectacular than even Skip is turning a new leaf and tempering his criticism of The King. How could you criticism a man who is averaging 34 points, nine rebounds and nine assists, leads the Cleveland Cavaliers in almost every major statistical category, and has dropped two walk-off game-winners in the Toronto Raptors series? The simple answer is, no you can’t. LeBron could quit now and his 2018 playoffs will go down as one of the greatest we’ve ever seen. LeBron should heed this advice: quit while you’re ahead. No one is suggestion that LeBron should flat out quit. You should never tell an athlete to quit. It’s not in a champion’s DNA, and it’s not something you’d want to tell your child when they face challenges in life. All we’re suggesting to LeBron is take your chips and cash in — at least for this season. There is no sense in continuing because, let’s get real here, there is only one team that’s going to raise that Larry O’Brien trophy in June and it’s not the Cavaliers, it’s not the Celtics and it’s not the Rockets. The Golden State Warriors are going to win the 2018 NBA title. Period. End of story. You can book it in Las Vegas. Don’t hold your breath for a big surprise in the NBA Finals because it’ll be the same old song. It’ll be the Warriors’ third championship in four seasons. Steph Curry, Kevin Durant, Klay Thompson, and Draymond Green are all going to pour champagne on their heads once again and they will hold another parade in the Bay Area, and there is nothing that’s going to stop that from happening. Do you honestly think the Cavs with their rebuilt-on-the-fly-roster can beat the Warriors? Not a chance. 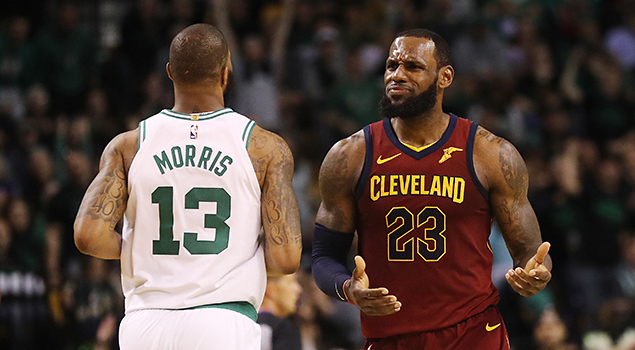 So, even if the Cavs can knock off the Celtics in the Eastern Conference finals and LeBron makes it to his eighth straight trip to The Finals, his legacy and his brand will take another hit following a third loss to the rival Warriors in four seasons. That’ll drop LeBron’s Finals record to 3-6. And when that happens, Twitter, Instagram, Facebook, and all the LeBron haters will have a field day. Again, we’re not suggesting LeBron should tank it against the Celtics. All we’re saying is when the Celtics push hard, LeBron shouldn’t push back. There is no shame in losing in the conference finals. The popular narrative will be “LeBron needs more help.” Losing to the Celtics not only won’t tarnish LeBron’s legacy, but it’ll allow ‘Bron to reboot and weigh his options during the summer. Let the Celtics be the sacrificial lambs this time for the Warriors.